Road tripping through the NSW outback is an opportunity to connect with both an ancient landscape and… yourself. 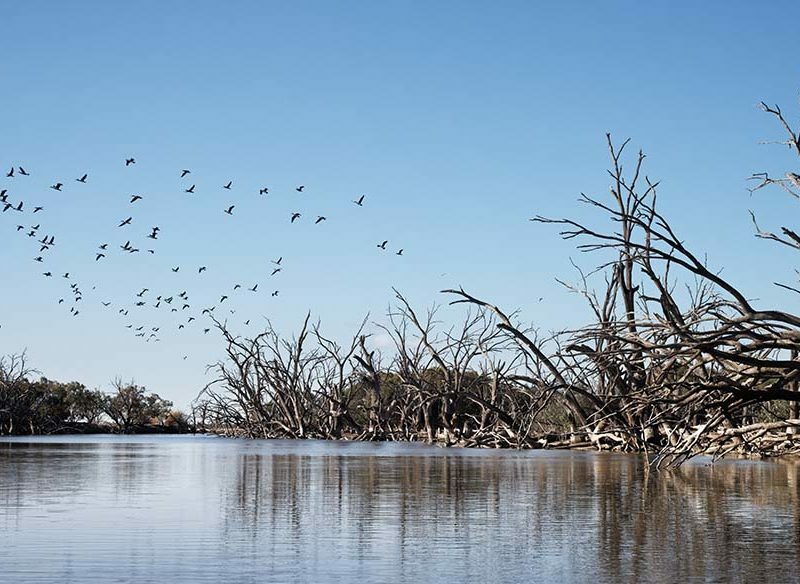 Isn’t it time you discover the Darling River Run? The tarmac road crosses its arms and refuses to budge another inch outside the town of Wentworth, where the fabled Murray locks arms in a river dance with the less-travelled Darling. 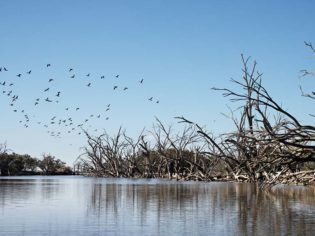 This is the starting point for a seven-day road trip north-east along the lifeforce of the New South Wales outback, the Darling River Run. Not your same-place-every-year-and-back road trip, that’s for sure. Northwards, the border town’s orchards should soon submit to the Wide Brown Land – in theory – but immediately it’s clear that while the land is always wide, it’s certainly never just brown. Exhibit A, just outside Wentworth: Perry Sandhills, a shifting gypsy beachscape that dissonantly rises above fenced fields. Here you can track mysterious animal prints in the sand, and stand in wonder at the God Tree, a giant river red gum which bursts through the sand. Arumpo Road is the more adventurous way to reach Mungo National Park, trailed by a dust cloud that puffs into the Pajero’s mirrors. Roughly 100 kilometres later, Mungo Lodge beckons. At the gate, charismatic Donatello the formerly wild goat greets us, seeking pats and snacks. The resident emus are less approachable but no less captivating. Our understated, roomy digs are finished in dark wood and contrasting earthy tones, a nod to the ancient lake bed we will head to this afternoon. In the refined yet unstuffy restaurant, with its broad red-brick fireplace and stately cypress-pine floors, the classic country fare is served on outback-sized dishes as generous as the people delivering it. Even from afar, Mungo National Park looks like a screensaver, unreal in the literal and complimentary sense. German from Outback Geo Adventures threads us delicately through Mungo’s sacred, incongruously named Walls of China, a commanding high point that spans 32 kilometres in length. Dusk radiates supernaturally off the ‘lunettes’: shadow-bending island-like formations that have mushroomed up from the sand, clay and salt, courtesy of immortal westerlies. Their textures, their incongruence, make Mungo a ready-made Star Wars planet. Their sunset tints are palette-defining: oranges burnt to perfection, peaches, purples and greens that are outliers in the outback. The dreamy oddities in the middle of this outlandishly open space are intoxicating, but it’s a pair of 42,000-year-old homo sapiens, Mungo Man and Mungo Lady, who lived on Lake Mungo back when it was actually a lake, which elevates Mungo to national park status. Mungo Lady (uncovered 1968) was ritually cremated and Mungo Man (1974) was buried with his hands crossed, sprinkled with red ochre. It’s important because it shows proof of mourning and spiritual beliefs, thus civilisation. This is crucial to the Indigenous narrative of the area, the Ngiyampaa, the Mutthi Mutthi and the Paakantji peoples, and scientifically speaking, evidence that Australia “bookend[s] humanity”, said geologist Jim Bowler, who uncovered the remains of Mungo Man.The pair are ‘home’ again – Mungo Man the last to be returned in 2017 from the National Museum of Australia in Canberra. But it’s not all just about Mungo Man and Lady; vast tracts of the Willandra Lakes region are a lazy archaeologist’s dream, a dense time capsule where past and present dissolve. Otolith (fish ear bones), hairy nose wombat teeth and mega fauna remains like giant emus and goanna-like beasties are never far from the surface. Add to these the world’s largest collection of Pleistocene human footprints and the telling remains of ancient campfires, the kitchens of their day. Having boarded a small plane for an aerial overview of the otherworldly landscape, we see the outlines of past pastoralist toil, such as the old Zanci Homestead and Mungo Woolshed, now surrogate museums to the outback’s intractability. Onwards towards Menindee, everlasting flatness rolls towards us, randomly interrupted by farm letterboxes and curious shrines to the local wit, like the tree just outside Pooncarie that has dolphin torches hung from its branches like Christmas baubles. Hulking boomers (male red kangaroos) bound from the squat khaki scrub, as if to keep us on our toes. We cruise slowly, taking in the wildlife and the panorama. Menindee’s volunteer tourist information centre is closed today, but there are plenty of ‘local guides’ in its cafes, pub and supermarket. One cafe customer, Stewart, selflessly appoints himself as our tour guide without fear nor favour. Bush hospitality proves to be anything but a fanciful yarn as we shake hands with half the town, including Howard Seddon, who opens the door to old Menindee, letting us roam around the historic cavernous Au Chung’s Bakery; started by William Au Chung and his English wife Emily in the 1880s, the room-sized ovens and industrial baking machinery have not made mouths water since the 1970s, but the hint of freshly baked bread still seems to hang in the air. Dusk radiates supernaturally off the ‘lunettes’: shadow-bending island-like formations that have mushroomed up from the sand, clay and salt, courtesy of immortal westerlies. As evening sets in we head to what is reported to be New South Wales’s second oldest continuously operating pub, Maidens Hotel (circa 1853). The original (gutted by fire in 1999) was a staging point for Burke and Wills’s ill-fated expedition, an arrow on a remaining doorpost apparently carved by the hand of one of the explorers. Just out of town, peckish emus graze on the broad shores of the Darling-fed Menindee Lakes system. We navigate the river’s twists aboard River Lady, whistling kites swooping, the air candied by ripe Boobialla berries. ‘Drowned’ trees crowd the banks. River Lady Tours’ co-owner Rob points to scars in the bark of the odd hundreds-of-years-old river red gum, the source of canoes and coolamons of traditional owners past. Relics from the Darling’s more recent commercial history are also there: an old paddle-steamer boiler and the skeleton of a robust wooden bridge that used to bear Cobb & Co coaches. Leaving Menindee behind, Wilcannia’s Courthouse Cafe is the perfect pit stop after two hours’ driving, replete with a small gallery space where you can browse Barkindji-fusion art. Ever northward, the road changes personality often: sometimes musical corrugations, other times smooth clay with gleaming minerals winking. Emus strut alongside nearby fences proud and aloof. Tilpa isn’t much bigger than its dot on the map, but like the Darling behind it, it flows with character. The town’s nucleus is Tilpa Hotel, which has its name and radio frequency emblazoned in huge letters on its corrugated roof. Inside, signatures and musings saturate every reachable inch of interior, even the ceiling fan. Our night’s accommodation is “just up the road” – just over an hour away, for those not used to outback distances. The 320,000-acre Trilby Station unfurls like a principality, owning the horizon in every direction. Its converted stockman’s quarters, the Overseer’s Cottage, is country cosiness personified, trimmed with decades of bush trinkets. Come dinner, co-owner Liz serves up cheese-and-chive damper and Nan’s stockyard chicken pie, crowned by a rich sticky date pudding. We waddle outside and take up position next to the fire pit, toasting the Milky Way with wine as roos softly thud in the untainted darkness. Just outside of Bourke, the tarmac reappears under our tyres. To keep the bush vibe rolling, we beeline for the Outback Show at Back O’ Bourke Exhibition Centre. The star is big-hat-wearing former jackaroo Paul Clarkson, who makes his stock horse Linko dance like they’re in a Strictly final. It’s then on for a serene cruise back into a time before the Darling was usurped by rail and road. Captain Peter Collins holds PV (Paddle Vessel) Jandra at a steady five kilometres per hour, and just as slowly enlightens us about river snags, golden perch and dancing brolgas. North of town, Jenny Greentree’s Back O’ Bourke Gallery is a highlight reel of the surrounding landscapes, her vivid-hued paintings unashamed odes to places deep in her heart, like the Gundabooka National Park. She’s passionate about Bourke and has plenty of ideas: for one, recommending a 90-minute stroll along the Darling’s banks with Come Walk With Us, and an insight into Bourke’s Indigenous culture. That night we collapse into Kidman’s Camp’s deluxe en suite log cabins, a homely reflection of Bourke’s bush heritage. We want to plant ourselves on the wooden rocking chairs out on the verandah and whittle away our morning, but the mesmerisingly straight drive back to the routine world beckons. Stealthily, the river whispers one final secret, on (Darling tributary) the Barwon River. Many travellers pass by Brewarrina. More fool them, because when they do, they miss arguably the oldest human-made structure on Earth: the Brewarrina fish traps. We check into Beds on the Barwon on a secluded stretch of river nearby for a final reflection. The week becomes a vivid memory of the road less travelled, where the landscape, the history and the hospitality make for a truly compelling experience. Meanwhile, boisterous parrots squawk their outback anthem awaiting their next audience. Time for you to find your little Darling, too?